Dew THIS: My Favorite Author releases a new classic!!! My Favorite Author releases a new classic!!! When I lived in Logan, Ut I found a series of books based on the scriptual accout of Nephi and thier journey through the wilderness to the promised land and then the family seperation. I have been hooked by this author ever since- Heather B. Moore. Just as I finished the Out of Jeruselam series I found out she was releasing a new book -Abinidi. I couldn't get my hands on it fast enough. Then came Alma. I just couldn't stop reading when ever I opened one of these books. Then finally this month along came Alma the Younger. Now, I also have a secret fear that when an author that I love keeps coming out with new books that maybe the new books will be a dissapointment to the previous titles. I eagerly awaited for my copy of Alma the Younger to come in the mail and was equally curious to see how this story could unfold without seeming over-the-top with the character of Alma the Younger. When I opened the first page, it was there- the horror, panic and terror that drew me into Abinidi- the climax of an awful event starting to happen and leaving me wondering "how did it come to this?" I was hooked and couln't put it down. The characters are real. The gradual decent of Alma the Younger completely believable (haven't we all felt a little wronged by someone in religious authority before). 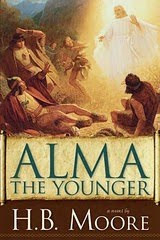 The conversion of Alma the Younger testifies to the truth of the account from the Book of Mormon. There is a pure spirit in those pages that complelty surrounds you. I was brought be to tears and testimony strengthend that God does hear and answer our prayers!